I made a huge mistake when I started blogging. I’m still not sure what I was thinking but overall didn’t understand how Pinterest worked and why it was so valuable to bloggers. If you are new to blogging, Pinterest is not a social media platform. Pinterest is a search engine. To take it a bit further, Pinterest is a visual search engine. Once I made this realization my view of Pinterest completely changed. I just wish I had been smarter a bit sooner. Don’t make the blogging mistake I did. Start using Pinterest even if you won’t start posting blog articles for 3 months. If you already have post, then pretty up your graphics (I use Canva and PicMonkey) and start sharing. The goal is to develop a well-rounded profile so that as you increase your blog posts, you will already have a sharing platform. I started using Tailwind in January. At the beginning of January 2017, I had 375 followers. The page visits numbers are even more impressive. I went from a total of 236 pages views from Pinterest in January to 2,520 in May. This is growth of 1068% in five months. Of course, it is easy to have such a large increase when you start out so small. Also, keep in mind this is spread across two blogs. I’m very happy with these numbers and even happier about the traffic numbers associated with that growth. It took a lot of time and effort to achieve this level of growth, but now that I’ve gotten a system set up, I typically spend 1-2 hours a week on Pinterest. I’ve noticed that as you increase your Pinterest presence growth seems to happen organically. 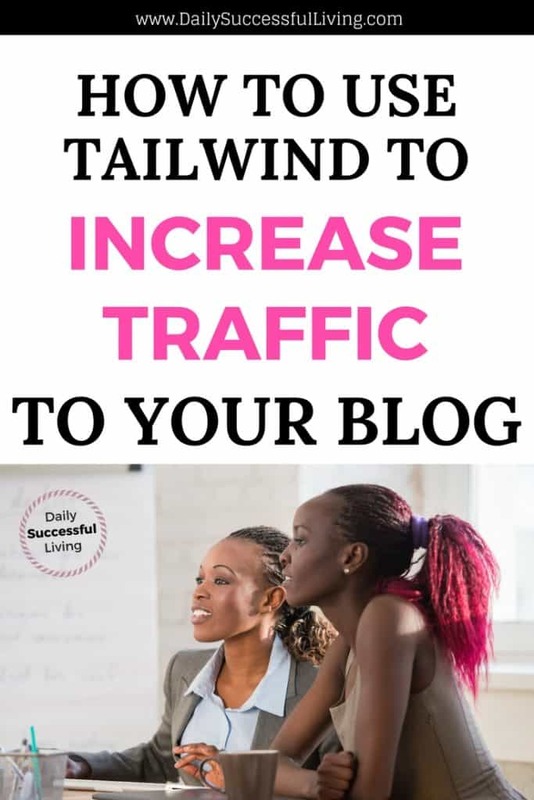 Tailwind is a Pinterest and Instagram platform designed primarily to increase your Pinterest exposure. It is super easy to use and the results speak for themselves. Tailwind is designed to make sharing pins simple and easy. Once you have connected your account, Tailwind will populate a weekly Pinning Schedule based on when your audience is most active. You can generate a schedule based on the number of pins you would like to share per day. I started with 5 pins per day and then once I had a month’s worth of pins in my scheduling queue I increased to 8, 10, 15 and am now around 18-20 per day. Most experts recommend pinning 40-60 pins per day, but at this point, I’m not at that level. It takes time to build up your platform and I’d rather work my way up then burn myself out. 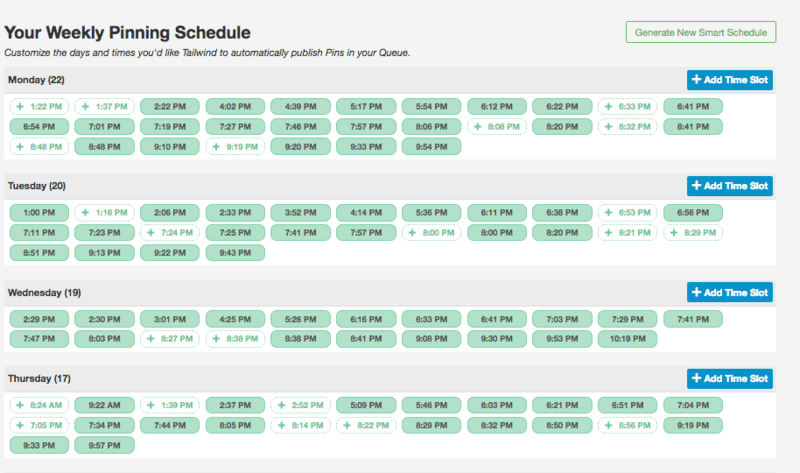 As you can see from the recommended pinning schedule you can easily add additional time slots. I’ve found that by using their recommended times, my traffic does seem to increase. Tailwind made the sharing process very, very easy. They created an addon for Firefox, Safari, and Chromo that is easy to install. When the addon is installed you can add any page you visit to your pinning schedule. Anytime I read a quality post, I immediately share it to my Tailwind feed for future distribution. The Tailwind App also works with Pinterest since it is an approved vendor. This means I can do a simple search on Pinterest Marketing and I immediately have hundreds of posts to potentially add to my Tailwind Feed. The biggest advantage I’ve found to Tailwind is Tailwind tribes. Anyone can create a tribe based on whatever type of posts they want to share. For example, I’m part of tribes that focus on Personal finance, debt reduction, social media marketing, parenting. As a member of the tribe, you can share your personal content to the tribe. This is a great way to increase your exposure to other bloggers, which increases your general Pinterest reach. Anything in the tribe can then be shared via Tailwind. I’ve found it is an amazing tool that makes content curating very simple. It is always a great way to get your content noticed as well. Here is a quick overview of my reach within one of the tribes. Since the tribes are moderated, the moderator can enforce the rules, which keeps the content high quality. Obviously, this is dependent on the moderator, but the groups I’ve joined have been well moderated. On a side note, I can group my sharing and easily share to multiple boards from the same pin. 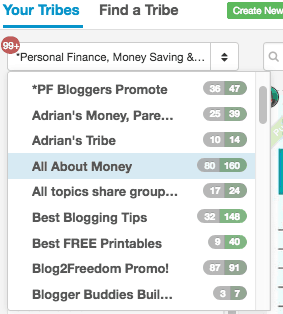 So for example, if I have a post related to personal finance, I can easily share the content to my personal boards and any applicable group boards. This feature saves me so much time. At a glance, I can share all of my personal finance content to the applicable boards quickly and efficiently. It makes it easy to manage my contributions to the group boards I’m part of as well. At this point, I know that I’m only scratching the surface of what Tailwind can do. I feel like every week I find new reports, features, and information that helps me grow my following. Their customer service is above average as is the knowledge base they provide through their help features. They have an extensive video library and a content library that so far has easily answered all of my questions. To get you hooked on their services Tailwind gives you your first 100 pins free and then charges $9.99 per month for up to 400 pins per month (which is a lot). If you want unlimited pins then you have to sign up for an annual plan. I know that $10 is a lot for most beginning bloggers. However, if you are going to spend money on one social sharing platform, I personally believe that the Tailwind Pinterest Pricing gives you the most bang for your buck. The traffic growth I’ve seen on my blog since starting Tailwind is amazing. As a small blogger, I fight for every visitor to my site. Pinterest has become my greatest traffic referral site. I know as I continue to grow and expand my Pinterest presence my numbers will continue to increase.